The horizon should sit at the horizontal line dividing the lower third of the photo from the upper two-thirds. The "main theme" should sit at the intersection of two lines, sometimes called a power point. Points of interest in the photo don't have to actually touch one of these lines to take advantage of the rule of thirds. 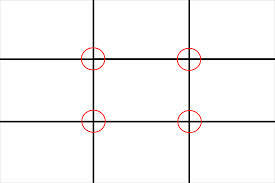 The rule of thirds is applied by aligning a subject with the guide lines and their intersection points, placing the horizon on the top or bottom line, or allowing linear features in the image to flow from section to section. The main reason for observing the rule of thirds is to discourage placement of the subject at the center, or prevent a horizon from appearing to divide the picture in half. When photographing people, it is common to line the body up with a vertical line, and having the person's eyes in line with a horizontal one. If filming a moving subject, the same pattern is often followed, with the majority of the extra room being in front of the person (the way they are moving). The rule of thirds appears as early as 1797 as a rule for proportioning scenic paintings. This derives from the "rule of thirds" but actually it was developed long before "rule of thirds" was even mentioned in writing anywhere in the world. The only thing that changes is the preferred intersection spots. There are 2 intersection spots used here, the upper right and the lower left. This technique was actually developed in Ancient Greece and is a master technique used in every ancient Greek statue or construction even in the Parthenon of Athens Acropolis. It is widely known with the Greek letter φ and it is equal to 1.61803399. 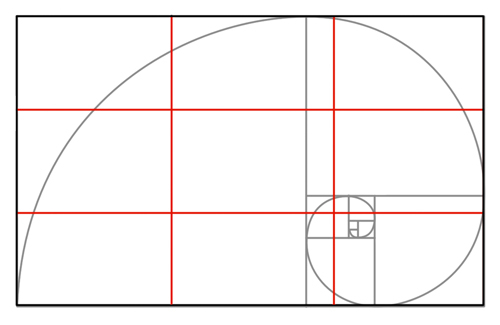 It is one of those mysterious natural numbers, like e or π, that seem to arise out of the basic structure of our world. Unlike those abstract numbers, however, φ appears clearly and regularly in the realm of things that grow and unfold in steps, and that includes living things.